Welcome to the home page for Richmond Towing Inc.
A busy city requires professional emergency towing and roadside assistance service 24 hours a day. Our experts are just a phone call away day or night. We are proud to be part of the best businesses in the Greater Richmond, Virginia area! Think about the different types of vehicles that travel Richmond highways and byways. There are a number of things that can go wrong with any one of them, from flat tires to dead batteries. If you’re locked out of your car or one of the trailers you are hauling with your big rig flips over, feel confident calling Richmond Towing for assistance. Our courteous, knowledgeable staff is ready to right whatever is wrong and get you back on the road quickly. 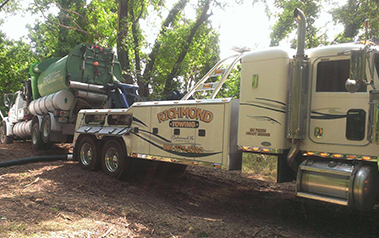 Richmond Towing has a wide variety of tow vehicles to respond to light, medium, and heavy duty towing requests. Recovering commercial trucks, school buses, and RVs are part of our normal operations. Call us if you need a classic car transported from one area to another. We treat your property as if it were our own so you don’t have to worry about its safety while under our control. Our location at 9932 Jefferson Davis Hwy, Richmond, VA 23237 is easy to locate. Storage space is available for equipment, trailers, tractors, and vehicles. Call us to schedule an appointment to discuss pricing and storage availability. Always leave your cell phone number with our emergency dispatcher so the tow driver can call to let you know the approximate time of arrival. It also helps the driver locate you and your vehicle in the event more than one person is waiting for assistance. We carry permits for out-of-state towing and hauling. Visit us on Facebook for scenes of some of our recovery operations and safe driving tips. You’ll also find us on Twitter, Google, and YouTube. Have a towing or roadside emergency?